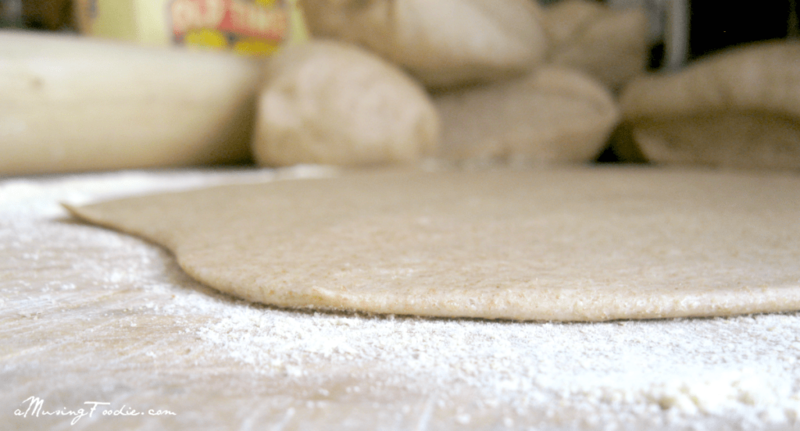 After you make this homemade whole wheat pizza dough, you’ll never go back to store-bought again. It’s so easy! I started making all of my own pizza dough last year after watching my sister and soon-to-be brother-in-law make theirs the past few years during our family vacations at Smith Mountain Lake. 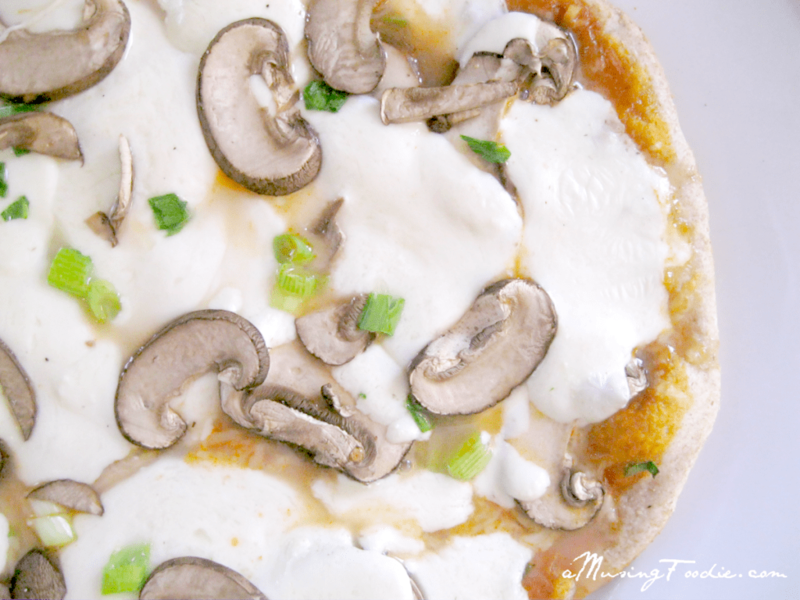 While my usual recipe calls for all-purpose flour, this time I tried an easy homemade whole wheat pizza dough (with only 5 ingredients!) instead. After mixing the yeast with warm water (140°F to be precise, but I prefer to just use my wrist – not hot, but very warm), I just let it sit for about 10 minutes until the mixture starts to look kind of foamy. 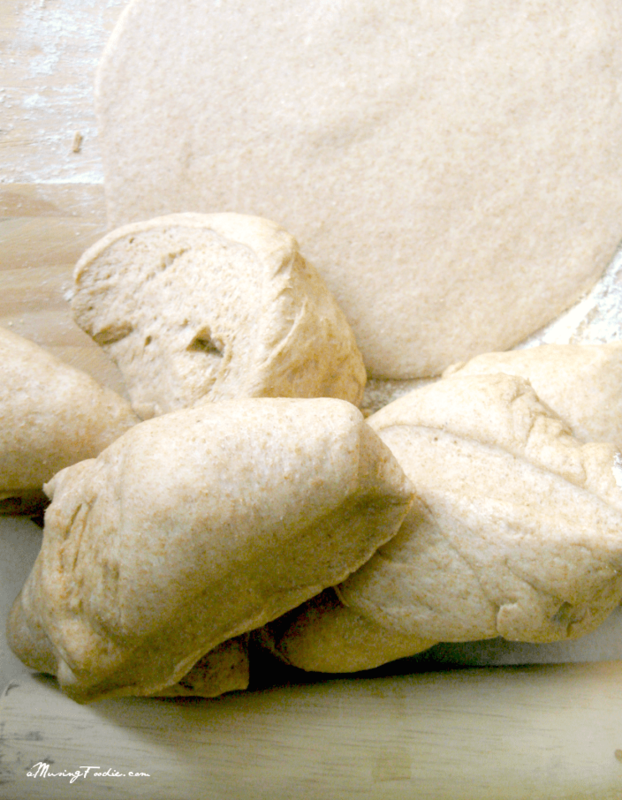 Then, I let my KitchenAid + dough hook do all the kneading work for the next 10 minutes. This is followed by 30 minutes of rising (mixing bowl is covered with a towel and set in a warm oven that I’ve let preheat to 170°F and then turned off), one punch-down, re-kneading by hand for a minute, and then more rising for about 15 minutes. 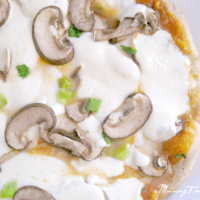 When it’s about 1/8″ thick, and baked in a super hot oven, this whole wheat pizza dough turns into a deliciously crispy chewy crust that keeps me fuller longer than its traditional all-purpose counterpart and can also withstand lots of fabulous toppings. This recipe makes 8 personal-sized pizzas, so I’ll use 4 immediately, and then freeze the remaining 4 for the next time we’re having pizza. The frozen dough thaws out nicely overnight in the fridge, but I’ve also thawed them in the microwave when I’ve been in a pinch! Here’s the finished pizza, baked at 500°F for 4 minutes and smothered with fresh mozzarella. I’ve also topped mine with local organic crimini mushrooms and organic scallions from our last Hometown Harvest small fixed bag – YUM! And, there you have it: easy homemade whole wheat pizza dough (with only 5 ingredients)! 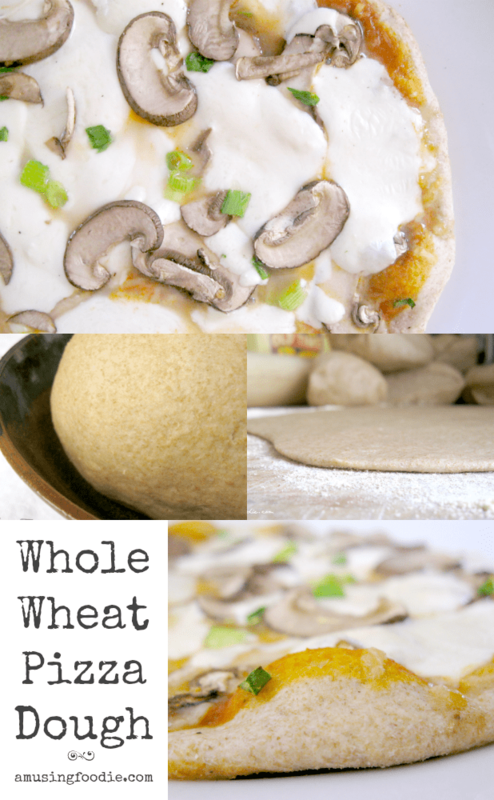 Easy homemade whole wheat pizza dough recipe made with only 5 ingredients! Preheat your oven to 170°F. As soon as it's done preheating, turn it off. 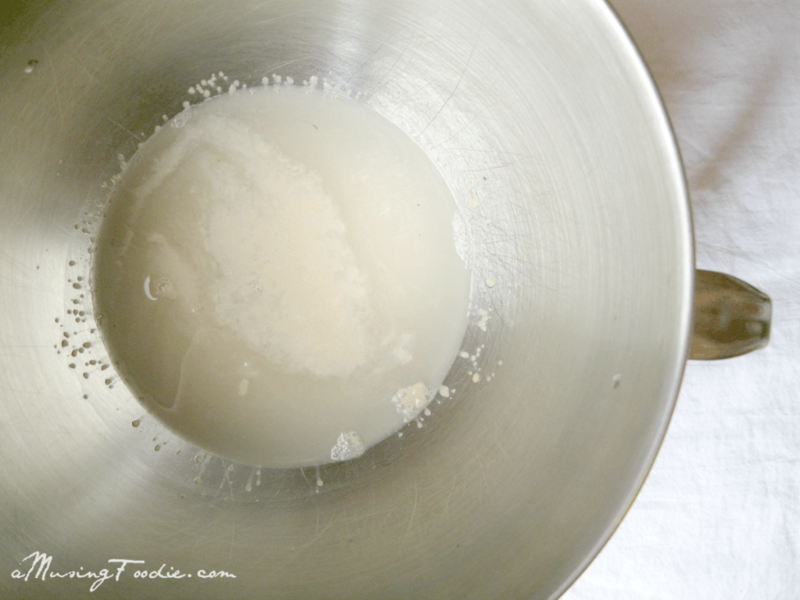 Combine the yeast and water in the bowl of a KitchenAid (or similar) mixer fitted with a dough hook. Let it sit for about 10 minutes or until you notice it starts to look foamy. 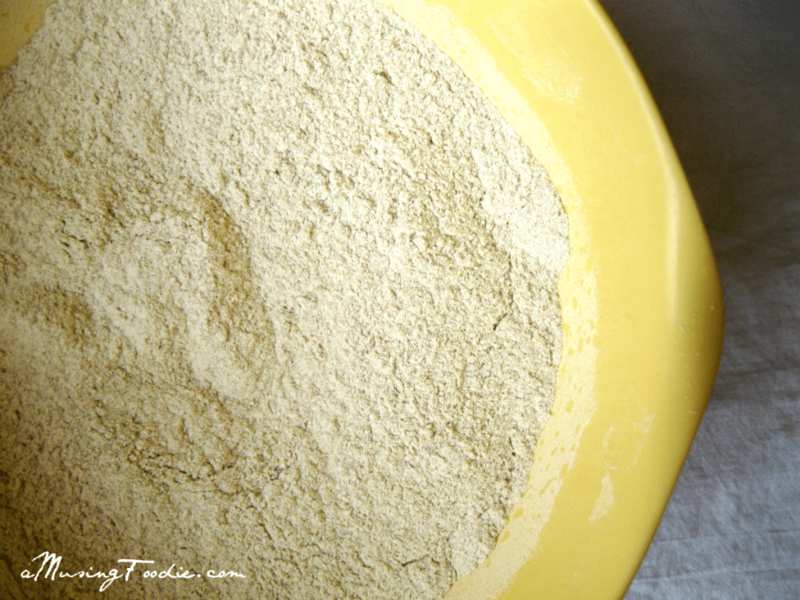 After mixing the flour and salt together in a separate mixing bowl, add it to the water and yeast, turn the mixer on low for 30 seconds, and then increase the speed to medium-low for another minute longer. When the ingredients have come together, increase the speed to medium and drizzle in 1/4 cup of olive oil. Let the mixer continue kneading the dough for 10 minutes; the dough should look smooth. Remove the dough from the mixing bowl and shape it into a ball. Coat the dough ball with 1 tablespoon of olive oil, place it back in the mixing bowl and cover the top of the bowl with a towel. Set the covered mixing bowl in the warm oven for 30 minutes. 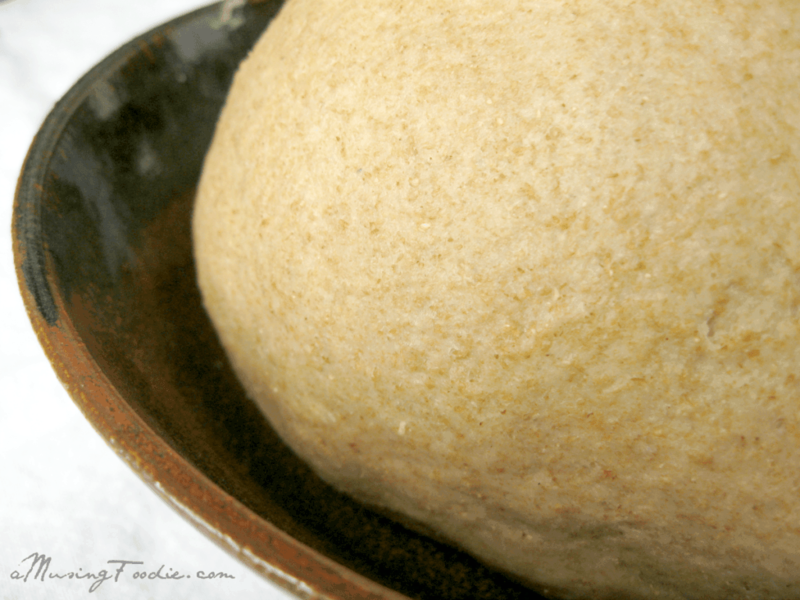 Remove the dough (it should have almost doubled in size), use your fist to punch it down, knead it by hand for a minute, reform the dough ball and then set it back in the warm oven (covered) for another 15-20 minutes. Cut the dough into 8 equal sized pieces for individual pizzas (if you're going to freeze some, just place them in a freezer-safe zip top bag and throw them in the freezer at this point). Roll each pizza to 1/8" thick, top with sauce, cheese and other toppings, and then place it atop a pizza stone that's been preheated to 500°F. 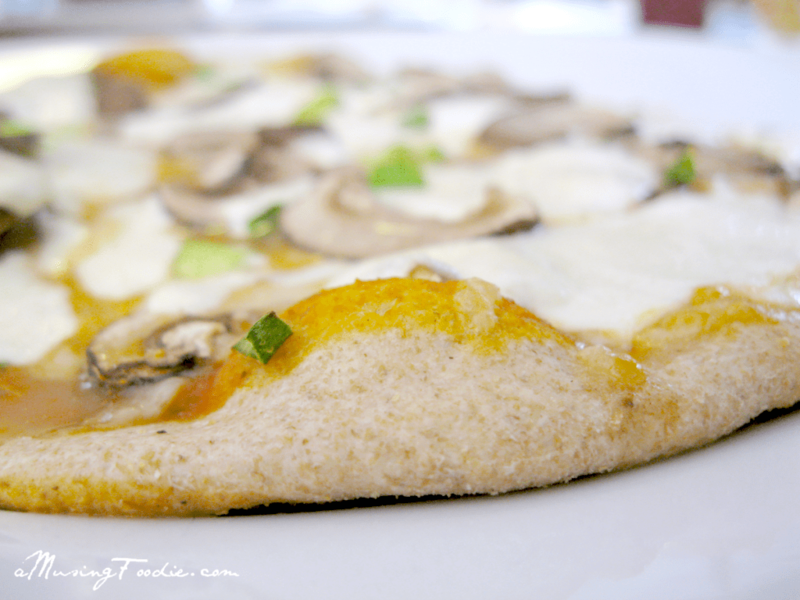 NOTE: I leave the pizza stone in the oven and use a pizza peel coated with cornmeal to slide my prepped pizza dough onto the stone. Cook the pizza for 4 minutes, or until the cheese is melty and the edges are golden. Let the pizza cool for a minute before slicing and devouring!